Notes: This uncatalogued postmark is very rare. The cover has also been signed by the stamp designer. 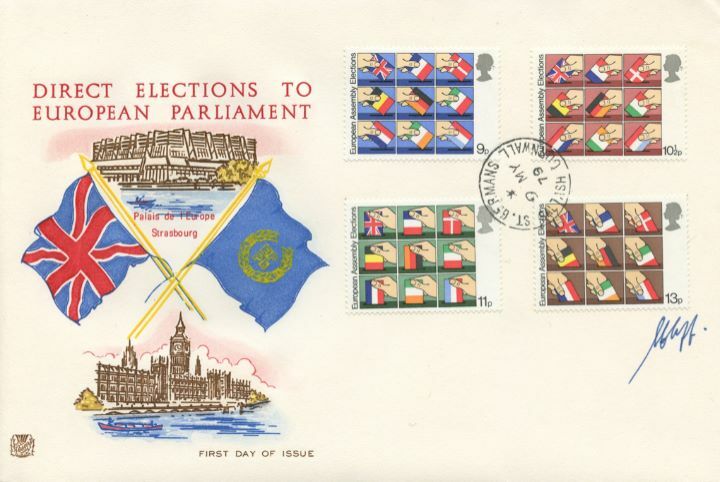 The above Royal Mail European Elections stamps were issued on 09 May 1979 by Royal Mail and feature the following stamp designs: 9p; 10 1/2p; 11p; 13p Flags of Member Nations. The Strasbourg and Westminster first day cover with the St. German's, Cornwall CDS Postmark postmark has been produced by Stuart and features these stamps which can make a very collectible and lovely gift.